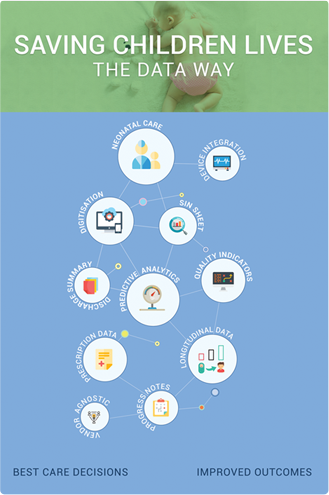 iNICU (integrated Neonatology Intensive Care Unit) leverages Beaglebone and Intel Edison based IoT integration with biomedical devices in NICU i.e. monitor, ventilator and blood gas machine. iNICU is hosted on IBM Softlayer based cloud computing infrastructure and map NICU workflow in Java based responsive web application to provide translational research informatics support to the clinicians. iNICU captures real time vital parameters i.e. respiration rate, heart rate, lab data and PACS amounting for millions of data points per day per child. iNICU solution aims to improve care time, fills skill gap, enable remote monitoring of neonates in rural regions, assists in identifying the early onset of disease, and reduction in neonatal mortality. Reducing child mortality with quality care is the prime-most concern of all nations. Thus in current IT era, our healthcare industry needs to focus on adapting information technology in healthcare services. Barring few preliminary attempts to digitalize basic hospital administrative and clinical functions, even today in India, child health and vaccination records are still maintained as paper-based records. Also, error in manually plotting the parameters in growth charts results in missed opportunities for early detection of growth disorders in children. 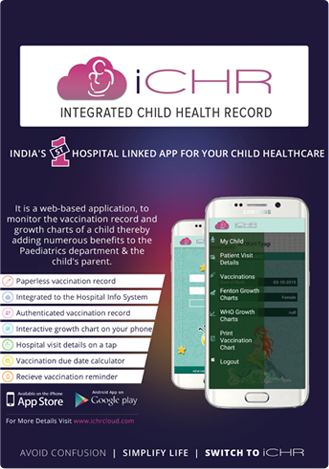 To address these concerns, we present India's first hospital linked, affordable automated vaccination and real-time child's growth monitoring cloud based application- Integrated Child Health Record cloud (iCHRcloud).